Political allies and foes alike offered heartfelt condolences after the passing of Sen. John McCain Saturday night. Everyone from President Donald Trump, who had a rocky relationship with the longtime senator, to former President Barack Obama, his opponent in the 2008 presidential campaign, to Sarah Palin, his former running mate, were saddened by McCain’s death. “But we shared, for all our differences, a fidelity to something higher -– the ideals for which generations of Americans and immigrants alike have fought, marched, and sacrificed,” Obama said in a statement. “We saw our political battles, even, as a privilege, something noble, an opportunity to serve as stewards of those high ideals at home, and to advance them around the world. “We saw this country as a place where anything is possible –- and citizenship as our patriotic obligation to ensure it forever remains that way,” the statement continued. 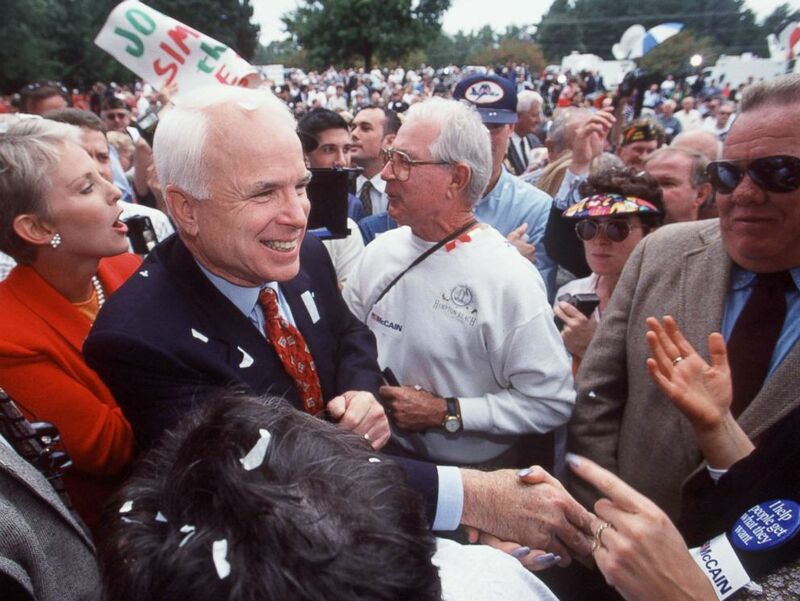 John Mccain declares his candidacy for President of the U.S., on Sept. 27, 1999, in Nahua, N.H.
“Sen. John McCain was a maverick and a fighter, never afraid to stand for his beliefs,” she said in a tweet. “John never took the easy path in life — and through sacrifice and suffering he inspired others to serve something greater than self. Earlier in the day, she thanked well-wishers for their support. “The entire McCain family is overwhelmed by the outpouring of love and support from around the world. Thank you,” Cindy McCain, who has been married to her husband for 38 years, wrote on Twitter Saturday morning. The entire McCain family is overwhelmed by the outpouring of love and support from around the world. Thank you.